Local Tips: The nearby beach in Agios Ioannis has been awarded a blue flag in recognition of the quality of its water and is a mixture of sand and fine stones. 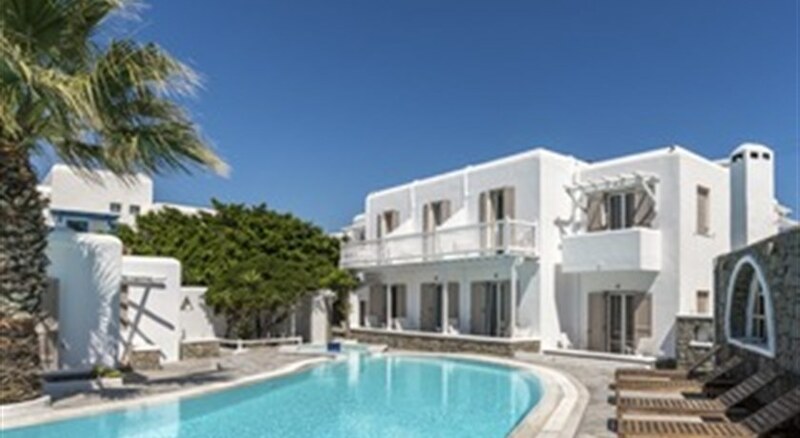 Food, drink and entertainment: Bed and Breakfast accommodation with a delicious buffet breakfast, pool snack bar, and plenty of dining choices in nearby Mykonos Town. Sports, games and activities: Swimming pool, sun beds and umbrellas, Jacuzzi, excursions, lounge with Satellite TV. Nearby beaches with opportunities to practice water sports. Additional: 24 hour reception, Internet corner, laundry service, help with excursions, car rental. The Vanilla Hotel features 25 twin/double guestrooms that can accommodate up to three adults and have either garden or pool views. All rooms have air conditioning (included in the rates), bathroom (bath or shower, hair dryer, WC), double or twin beds, flat screen Satellite TV, Wi-Fi Internet access, mini bar, safe (included in rates), telephone, and a balcony or terrace.